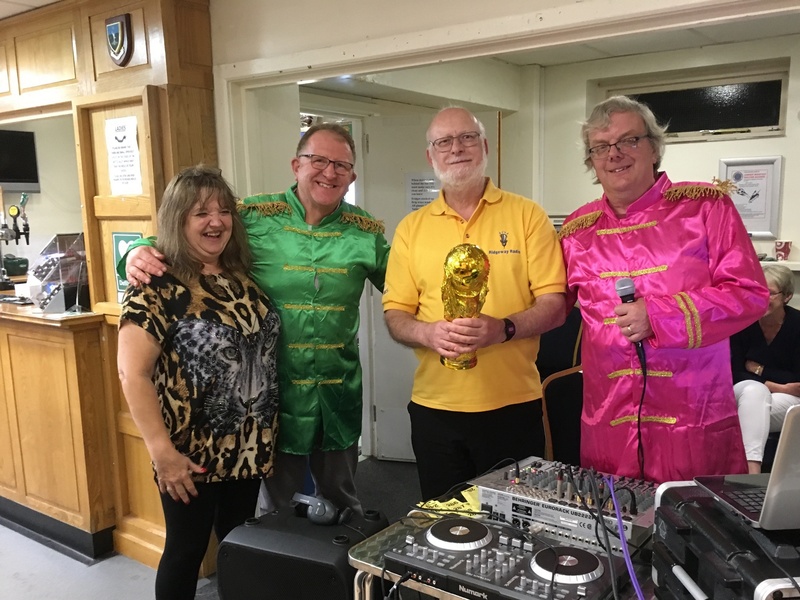 A very entertaining 60s Quiz Night was enjoyed by a happy gathering of people at Dorchester Football Club on Saturday 8th October 2016 hosted by the Mayor and Mayoress of Dorchester, Tim and Anita Harries, with Ridgeway’s Andy Senior assisted by Kevin Brookes providing the musical questions and another set of questions on 60s events provided by Anita. The picture shows Chairman Andy Worth receiving the trophy on behalf of the winning team which included, besides himself, the Vice-chairman, Secretary and Treasurer……not that we want to boast of course….ahem! (Blimey, are we really that old!) And yes, it’s the World Cup! It’s real gold…..honest! Some cash was raised for Ridgeway Radio in this, the 50th anniversary of hospital radio in Dorchester. With thanks to the Mayor and Mayoress, Andy S and Kevin, and Dorchester Football Club for putting on this most enjoyable event.